2.Pay attention to the natural habitat of the plant, & its preferred light & heat levels. Try to reproduce the conditions it would find in the wild. 3.Most plants prefer to dry out a little between thorough waterings. 4.Water from below - stand them in a dish of water until all the water has been taken up. Feed regularly to keep them healthy. 6. 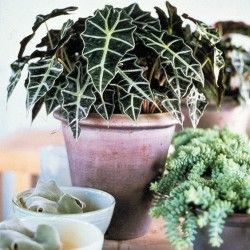 Plants that like high humidity need regular, preferably daily misting; stand them in a saucer of damp pebbles to encourage additional localised humidity. 8. Pinching out the tips of some houseplants can encourage them to grow bushier; keeping flowering plants slightly potbound makes them flower more. 9. Avoid strong heat or chilly draughts. Many houseplants like to be outdoors in summer - check all frosts are over first. Do not buy plants that have been standing in the cold, as they may be frostbitten. 10.Check your plants regularly for signs of stress, pests or disease. Remove dead leaves and flowers as they occur.